Two weeks after a nine-month-old was forgotten in the family car and died, a similar tragedy struck. Tragedy struck on Sunday in the village of Shiloh, in the Binyamin region, north of Jerusalem. According to reports, a five-month-old baby was forgotten in the family car Sunday, in temperatures of 31Celsius/88Fahrenheit. 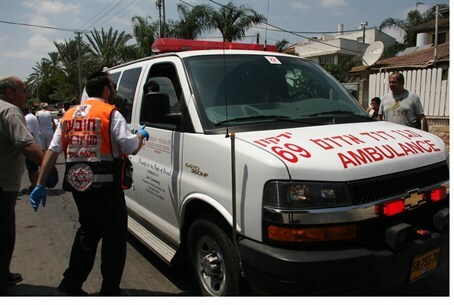 Magen David Adom paramedics who arrived on the scene tried to resuscitate her but had to pronounce her dead. The baby, whose parents required medical attention upon discovering the tragedy, was apparently found with severe burns. The police have initiated an investigation. Maariv reported that an initial inquiry showed that the girl's father was supposed to drop off his children at summer camps and nursery schools in the morning. Only at about 4:00 p.m. Did the parents realize that the baby girl was still in the family SUV. The mother ran to the car and found the baby unconscious and with no vital signs. Two weeks ago, a nine-month-old was forgotten in the car in similar circumstances in Ramat Gan. She was left in the car from 9:00 a.m. and was not found until 4:00 p.m., after she had died.